« Goodbye White Bikini, Hello Tie Dye Bikini! Quick, somebody stop me from cutting hearts into the backs of all my t-shirts! 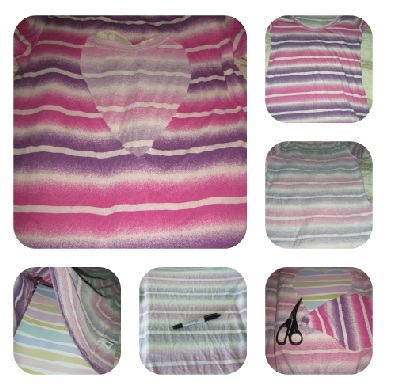 This DIY open heart tee is easy to make, it is fun, flirty and perfect for summer! All you need is a t-shirt and scissors, but I recommend a marker (or pencil, pen, crayon, etc…) and a binder or piece of cardboard as well. Have I mentioned that I get excited over the most basic DIY projects? Turn your t-shirt inside out. On the back draw the outline of the heart you will be cutting out. Keep the edges of the heart away from the edges of the shirt to prevent it from ripping. Carefully cut out the heart. Be sure you’re only cutting the back of the shirt – I placed a binder inside the t-shirt for this reason. Fun fact: the binder I used contains a constantly growing list of blog post ideas as well as rough drafts for a couple of upcoming blog posts! I have come to accept that patience and precision are not my strong points but I am working on this, especially when it comes to DIY projects. If you are fussy, you may want to tidy up your cut when you are done. That’s it, you’re done! Now get out there and enjoy summer! PS: Don’t forget to apply sunscreen if you wear this out in the sun or you may be sporting a heart on your back longer than you planned! This entry was posted on June 26, 2013, 8:35 am and is filed under DIY, DIY Fashion, DIY T-Shirt Tutorials. You can follow any responses to this entry through RSS 2.0. You can leave a response, or trackback from your own site. Yeah it’s really fun, just make sure you chalk out your pattern really carefully and hold the fabric tight or it gets a bit messy! !